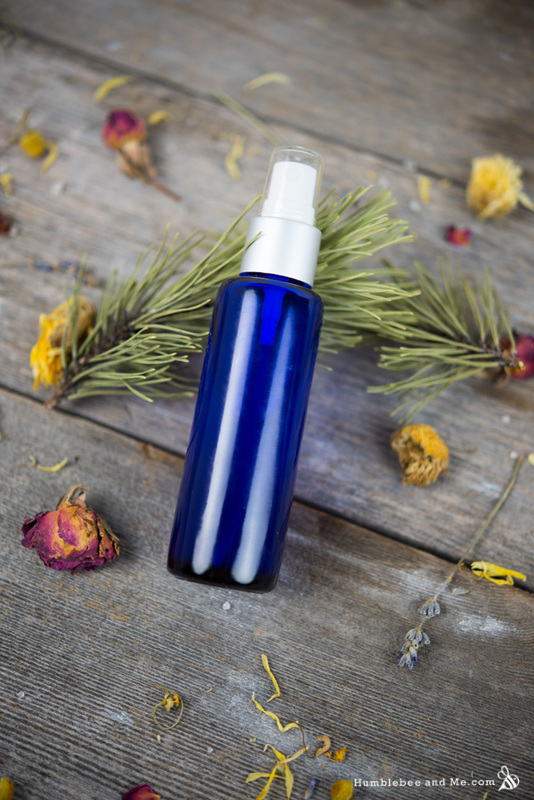 The base of this mist is a blend of distilled water and a lovely refreshing peppermint hydrosol—not too much, though, since to much mint on your face goes from refreshing to unpleasantly chilly fairly fast. To that base I’ve added some of my favourite humectants to help attract water to our skin and keep it hydrated. For liquid humectants I’m using a blend of glycerin and sodium lactate, bit if you only have one, feel free to to use all of one or the other. I wouldn’t increase the total amount, though—too much glycerin can get sticky, and too much sodium lactate (2.5%+) can make your skin sun sensitive. I’ve further decked out this facial mist with some powdered humecants (yours may be liquid, that doesn’t matter!). Hydrolyzed silk is one of my favourite humectants, and when paired with panthenol (vitamin B5) you’ve got some serious hydrating, skin soothing, healing boosting goodness. If you don’t have silk, look for a different hydrolyzed protein instead, like oat or even quinoa. I have powdered silk peptides, but silk amino acids and liquid silk are also good choices. 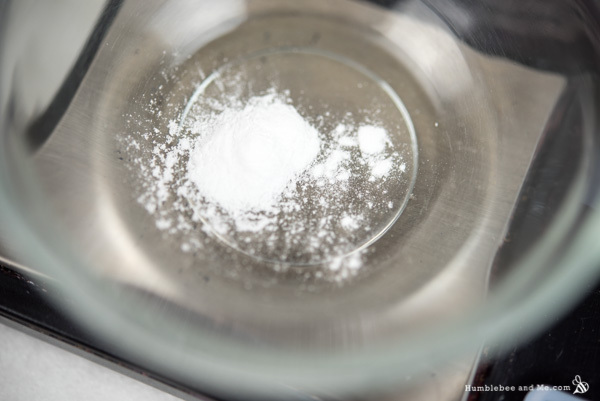 The powder will work, too, but it is a higher molecular weight and is therefore less likely to penetrate the skin and work its magic. To round things off I’ve included a touch of allantoin to help soothe and protect the skin, and some Olivem300 (INCI: Olive Oil PEG-7 Esters) as a super lightweight emollient. Olivem300 is a liquid ester derived from olive oil, and because it’s water soluble we can add it to this mostly water concoction and get a bit of moisturizing oil goodness without worrying about including any other emulsifiers. Before anybody asks if they can use Olivem1000 instead of Olivem300—no, you can’t. Olivem300 is a lightweight liquid, while Olivem1000 is a flaky, shardy solid wax-like product. They are not at all interchangeable! You could use a different water-soluble ester, though. Another major bonus of including a touch of Olivem300 is that it works as a solubilizer for small amounts of other oil soluble ingredients, so if you don’t have peppermint hydrosol, you can use a total of 47g (1.66oz) distilled water and add a single drop of peppermint essential oil to get a similar effect. Please don’t add more peppermint until you’ve tried it on your face, though! 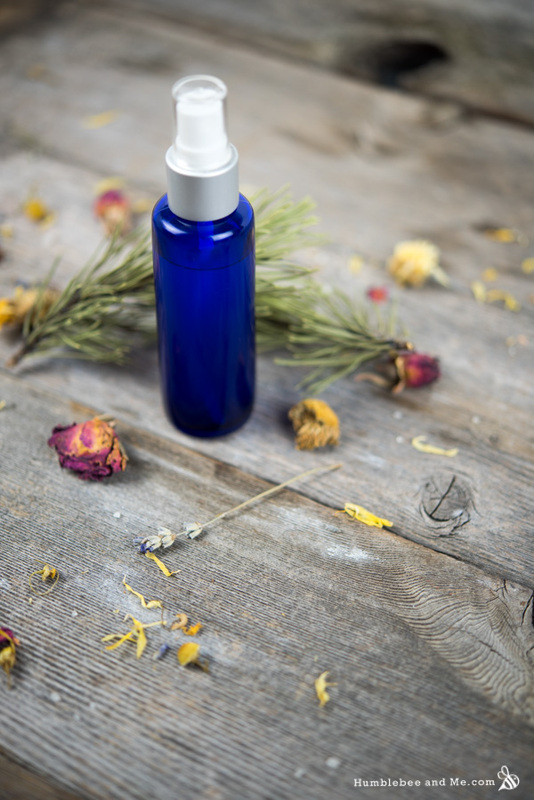 It’s much easier to add another drop of essential oils later than to chuck out your batch of spray-able face ice and start over. When I made this for myself I made a 50g batch to fit my 50mL bottles (sadly they’ve been discontinued, so I can’t link you to the ones I used), but this 50g batch business created a lot of teesny measurement business. 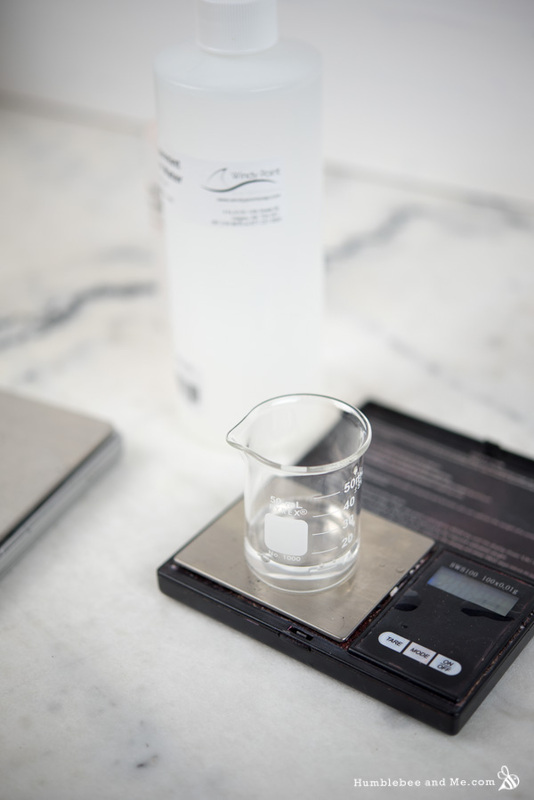 To help with that I have provided some volume measurements for some of the powders, but an even easier way to reduce the teensy measurements is to double the batch size to make 100mL (3.3fl oz) instead of 50mL (1.7fl oz). The second-to-last step is a slightly new thing for me; pH buffering to get the pH of this mist down closer to that of our skin. I’ve been doing a lot of research into the importance of the pH of our skin care products lately, and suffice it to say, having our skin care products be close in pH to the pH of our skin is super important. You’ll definitely be hearing more about this from me in the future, but for now this is a fantastic read. Now, you certainly don’t have to pH buffer this mist, but check out that article and see what you think. Also—if you have a pH meter that’s available in Canada that you’re happy with, I’d love to hear about it! Prepare a water bath by bringing about 2cm/2/3″ of water to a bare simmer over low to medium-low heat in a small saucepan. 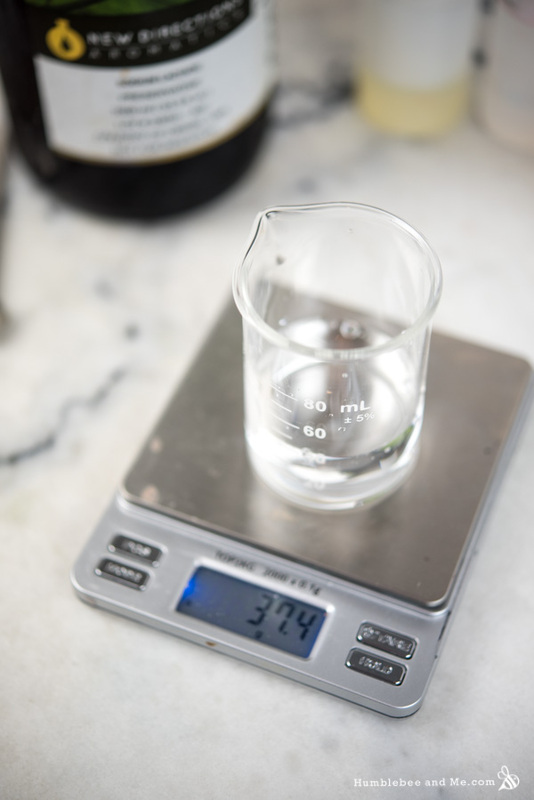 Weigh the distilled water, allantoin, sodium lactate, glycerin, silk, and Olivem300 into a small heat-resistant glass measuring cup or beaker. Place the measuring cup in your prepared water bath to heat everything through and make sure that allantoin dissolves properly. While your heated phase is heating, combine the peppermint hydrosol and panthenol in another small heat-resistant glass measuring cup or beaker. Set that aside. 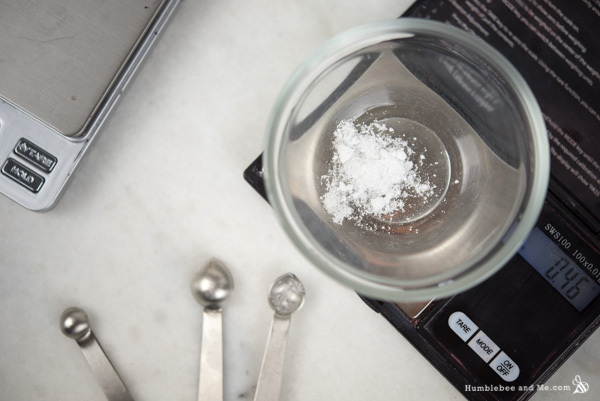 Once the heated part is fully dissolved, remove it from the heat and leave it to cool for about five minutes (small batches mean faster cooling times—give it longer if you double the batch). When the outside of the beaker just feels warm to the touch, add your cool down phase and stir to combine. To buffer: Use your pH strips or pH meter to check the pH of the mist as-is. Mine was about 6. Add some citric acid, a little bit at a time (start around 0.1g), re-checking the pH between addition to see where it is. Stop adding citric acid when you’re around 5.5. 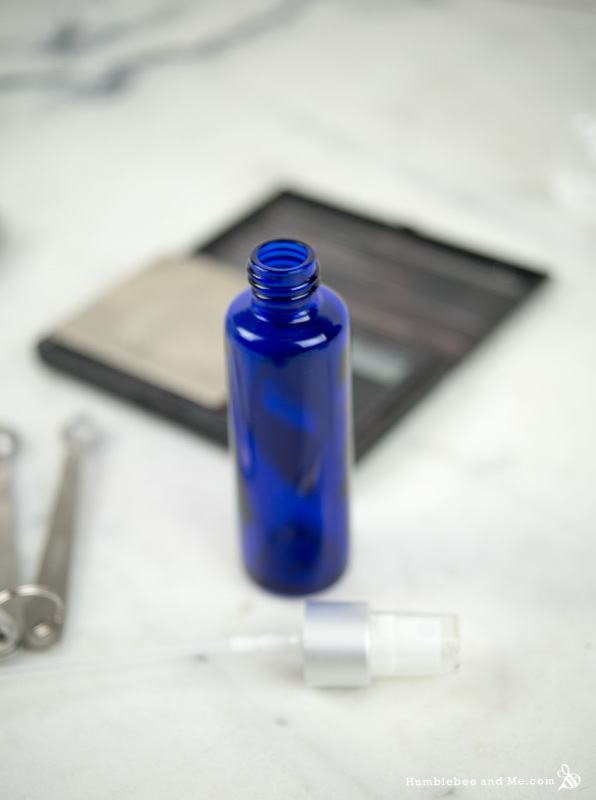 Stir in your preservative, decant into your mister bottle, and you’re done! 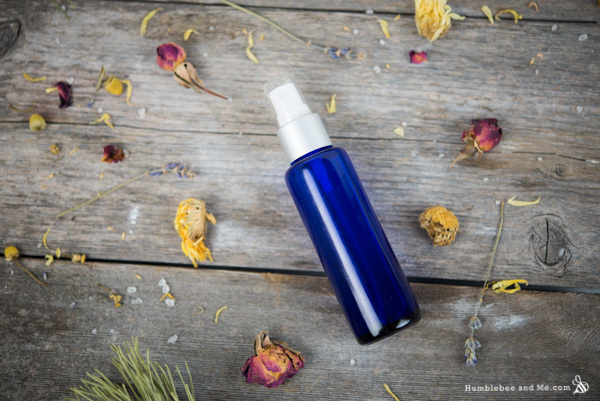 If you really just have water, peppermint essential oil, a polysorbate, and a preservative you can still make a nice face mist; it just won’t be nearly as hydrating. That would be 49.5g water, a single drop of peppermint essential oil mixed with three drops of Polysorbate 20 or 80, and 0.25g Liquid Germall Plus. Love the sound of this mist Marie, it is really warm here at the moment so would like to whip this up tomorrow. I can’t get Olivem, could I use decyl glucoside, or would polysorbate be better? Thanks for your help and another great summery recipe. Look in the substitution section after the recipe for the answer to your question. I’d recommend a polysorbate instead 🙂 Happy misting! Oh wow Marie I couldn’t make this fast enough when I saw your post!! I followed your instructions , watched the your video too! I love this amped mist ! Can this recipe be used with other essential oils ? I hope so! I tripled this recipe…. And on my label I call it ‘Posh Peppermint Mist’ ! Thanks , I love it! I’m really thinking you can read my mind. I began looking at ph meters the other month! Haven’t settled on one yet as the only ones I’ve seen are imported and that means a massive price hike. On Wednesday I made a Cucumber Mint Toner that is almost oddly similar to this recipe. 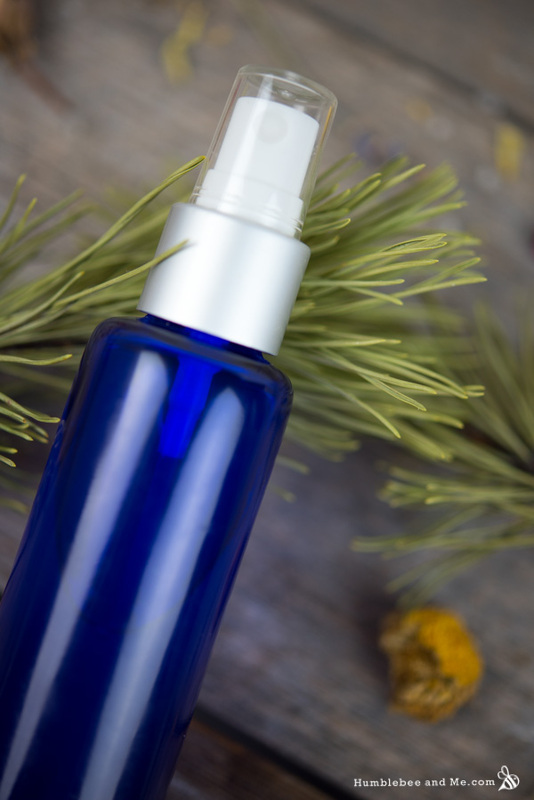 Must try this one out and see if I can use it as a refreshing spray through the day! I have one in my cart that I’m just procrastinating on buying. Cyn found it for me and it looks great! OK, so I took a look at that article (well, the part referring to skin pH and soap—the testing of the soap wasn’t of much interest), and then I looked at a lot more studies, and I think she’s wrong/not entirely right/using old data (there’s a 1966 German study that says the re-set time is about 2 hours). The main thing I looked into was her assertion that healthy skin can pH correct itself in 15-90 minutes. If that was the case obviously this wouldn’t be problematic as people frequently go at least an hour between washings, and I assume that’s what she’s getting at. One of the studies she links to specifically tested for this, and after 6 hours the subjects skin had not completely returned to pre-wash pH. At the one hour mark pH was still significantly raised. Also, that study (“The long-term use of soap does not affect the pH-maintenance mechanism of human skin”) relied on self-reporting to create the two test groups and was sponsored by a company that sells both soap and syndet bars, so the fact that this study concludes that both are a-ok seems a bit… convenient. I was unable to find the full text for “A comparative study of the effects on the skin of a classical bar soap and a syndet cleansing bar in normal use conditions and in the soap chamber test” (another article she links to), but right in the abstract it notes that the group using soap experienced an increase in skin pH. They just say “small”, no note on what that is, but still—that indicates that the skin does not auto-correct itself in less than 2 hours because if it did, there would be no increase in the soap group. “The Concept of the Acid Mantle of the Skin: Its Relevance for the Choice of Skin Cleansers” (M.H. Scmid, H.C. Korting) is a really interesting study. They show that test groups that washed with soap had a noticeable increase in skin pH in a matter of weeks. They do note that the initial pH bump from cleansing from both bars was mostly resolved in two hours, but the changes from the soap accumulated. “In those volunteers who started washing with the syndet, the skin surface pH remained stable or slightly declined; after the cross-over to soap, the pH rose above the baseline values.” In a similar study on acne-prone individuals they found those washing with soap saw an increase in acne and irritation, while those using the syndet saw a decrease. This was found to be because p. acnes, an acne-causing bacteria, thrives in environments with a pH over 6, but dies off in environments with a pH 5.5 or lower. I also recommend “Skin pH: From Basic Science to Basic Skin Care” (Saba M. Ali and Gil Yosipov) if you can find a copy—it’s one of the best things I’ve read all week! I’ve been attempting to gather this all into some sort of an article here. It’s still pretty scatterbrained, but there are lots of good quotes and links in there. All of that said—from everything I’ve read, it does seem like frequency is the biggest factor in accumulating pH shift. So, while using soap on your face likely isn’t a great idea as that is washed 2x a day (as in the studies that found the shift), using it in the shower 2–3 times a week is likely fine. Thank you for taking the time to search this through. I mostly put that link to get your feedback. I also find that some CP soap when used e.g washing hands as frequently as i do, can feel drying/annoying. But so can some surfactant based hand washes. There is this “trend” of avoiding surfactants due to irritation and using CP soap instead. I think this is partly true. There are indeed harsh surfactants that are used in personal care products. But i also think that irritation could be due to a fragrance or the preservative in it (or bad preservation). I used to break out in hives every time i took a shower. Then i tried CP soap with mixed impressions. Then i went back to store bought and tried many till i settled on sth that i don’t react to (90% of the time). Now i’m dabbling in soapmaking and trying to figure several things out. Like what is the best use for it: shaving, showering, shampoo, making the closet smell good?? After all the pH related things I’ve read, I’ve been wondering whether it’s a good idea at all. Like a “do it for the creativity process not the end product” sort of hobby which seems kinda pointless. 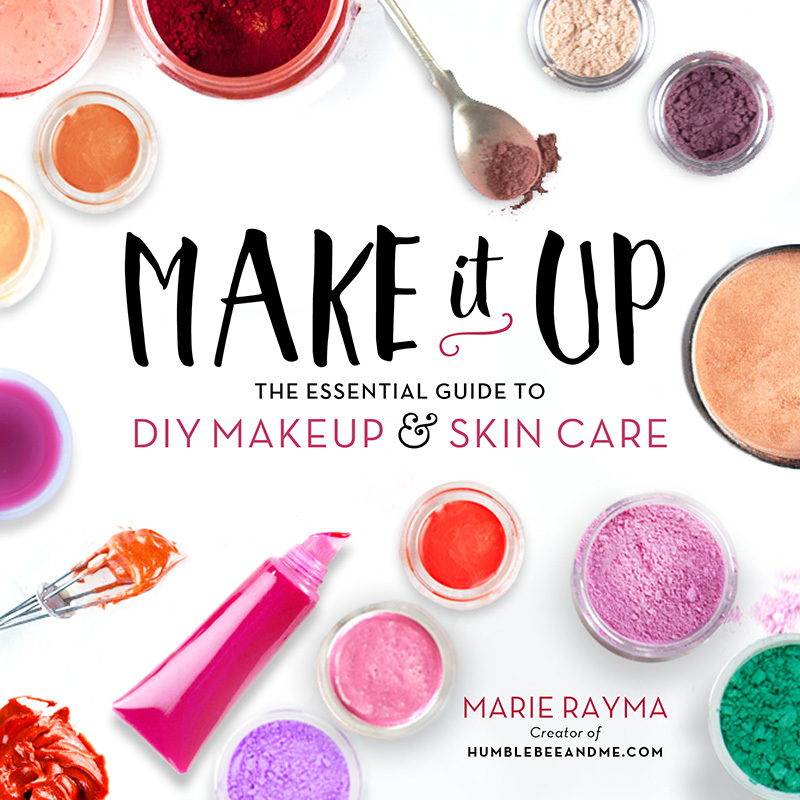 I think this part is very interesting: “Hence there is amply evidence that there is both a short-term and a long-term effect on skin surface pH if a cleanser is used whose pH deviates from the pH of the skin surface to which it is applied.” Wondering how serious the implications of this are. You’re welcome! It was really fun 🙂 One of the studies actually looked at surfactant washes that had been buffered up to a pH of 8.5 and those had the same impact as soap, so it’s not surprising that some surfactant washes you’ve used are drying—it’s easy for a surfactant wash to still be basic. pH also isn’t everything; a pH balanced wash that has an overly strong blend of surfactants can be irritating (like if there’s SLS in there!) regardless of the pH. Can’t wait to try this recipe. I saw that you mentioned in an earlier comment about a Ph meter. Is there a particular one you recommend? Additionally if I wanted to incorporate Aloe Vera Juice, how would you substitute that in? Also if I wanted to replace the distilled water for another hydrosol, that should be fine right? I’d recommend keeping the amount of aloe/hyrosol to 25% or less of the entire recipe. You can swap out some of the water for those ingredients, but don’t replace it entirely as that creates a large preservation challenge. I am thinking of trying my hand at making my own facial spray or serum. However, someone told me that Germall Plus and Optiphen are not intended to be used in skin care (i.e., on the face or near the eyes/mouth), which completely freaked me out! What are your thoughts on this? I’d recommend this resource to learn more. Usage regulations vary around the world, and there are specific regulations for lip safe, but I’ve never found anything for “face safe”. The Candora Soap site says that liquid germall isn’t recommended for sprays or mists. Would that be this or are they referring to something that sprays a finer mist?